Today was six degrees at Central Park, which is 20 degrees colder than it was the same time last year. We were told this would be one of the coldest years New York has experienced in many years. As you can tell by our blogs, we love Central Park. The park has everything. During winter months, ice skating. During warmer months, boat and bike rentals. 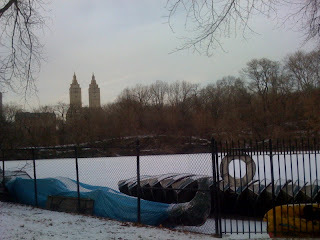 This is the New York Boathouse overlooking the (now frozen) lake. We're not looking forward to the summer but we're definitely planning on renting a rowboat and taking a ride in a Venetian gondola. The Boathouse restaurant is beautiful, especially the deck on warmer months, but the menu is a bit fancy and expensive for us. Notice the two tall buildings in this photo - they were used in Ghostbuster (and are also currently the homes to many of New York's rich and famous actors). 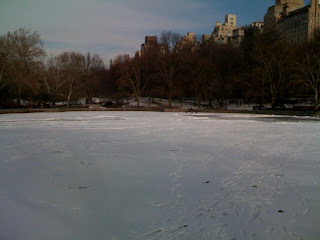 This is one of Central Park's ponds. Aside from one person ice skating and two people playing ice hockey, it was barren and clam today. 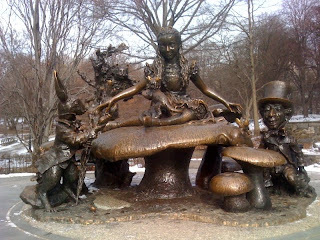 We're always amazed at the things we stumble upon at Central Park, like this Alice in Wonderland monument.